Theremin World - G4TV's AOTS presents "The Science Behind Theremins"
G4TV's AOTS presents "The Science Behind Theremins"
Kudos to G4TV for a huge contribution to World Thereminization! Last night's Attack of the Show episode featured a 3 minute spot about theremins and how to build an Etherwave kit. Excuse them for flubbing a couple of tiny details (those aren't capacitors) - they're TV hosts. Still, we'll give them credit for bringing the theremin out into the open for their hundreds of thousands of tech saavy and creative fans. 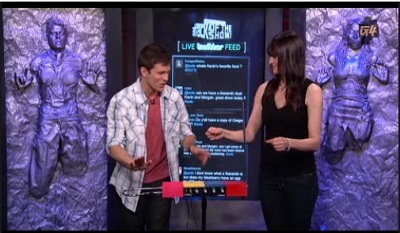 For anyone who happened to find our little community after watching the segment, welcome to Theremin World!